Jim Thome gives a speech during his Phillies Wall of Fame ceremony. Charlie Manuel, the Phillies 2014 Wall of Fame honoree, shares a special bond with Jim Thome that goes back to when both were in the Cleveland Indians minor league system as coach and player. So you’d understand if he’d be prone to hyperbole when introducing his long-time friend, who was about to get his own permanent plaque at Citizens Bank Park. Manuel said that Thome, along with former Phillies outfielder Aaron Rowand (who was traded for Thome) and former general manager Ed Wade deserved World Championship rings in 2008 for the impact they had on the team, even if they were with other organizations at the time. Sure, it’s a stretch. But you’d probably have a hard time finding anyone who has ever worked with the Phillies – in any capacity – to disagree about the point when it came to Thome. Thome never won a championship ring during his celebrated career, but, like Ted Williams (and many others before him), it surely won’t stop him from being bestowed with baseball’s greatest individual honor when he’s elected to the National Baseball Hall of Fame in 2018, the first year of his eligibility. Before that day arrives Thome will be celebrated with every organization he made an impact with, including the Phillies. 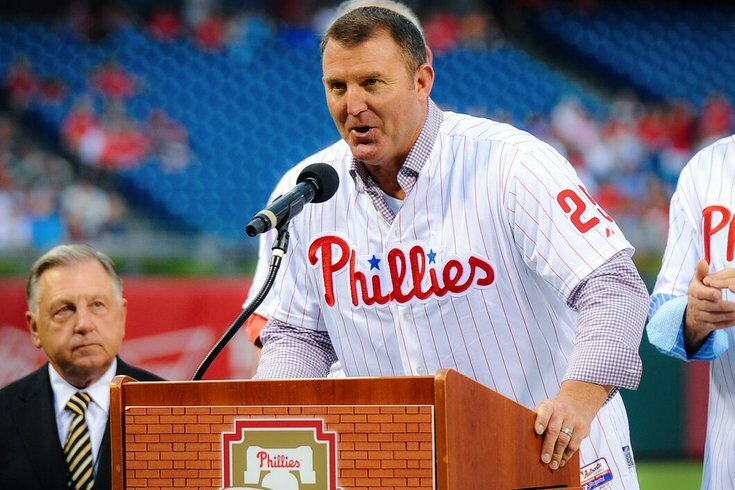 Thome, who brought an exciting brand of baseball to Philadelphia for the first time in a decade when he arrived in the winter of 2002-03, became the 38th member of the Phillies Wall of Fame on Friday night. Thome gracefully went on to thank the people that brought him to Philadelphia and just about every single individual he interacted with along the way. He even thanked the Philadelphia media. Imagine that. Afterward, Thome met with the media for a formal press conference. “Humbled,” said Thome, who spent less than four seasons in Philadelphia but still made enough of an impact (he did hit 89 home runs in his first two years) to join the franchise’s greatest fraternity. Thome, who finished his career with 612 home runs, seventh most in baseball history, arrived in Philadelphia as one of the city’s most celebrated free agent signings in December of 2002. He helped the Phillies close out Veterans Stadium in his first season and open Citizens Bank Park a year later. Thome was traded before the 2006 season, as Ryan Howard emerged (and won MVP honors that year). A year later, the Phillies were in the postseason for the first time in 14 years. The World Series parade followed a year later. “You know what? You genuinely have to root for people you care about. That was a moment that you put yourself and selfishly, you want to be there. But you have to be happy for people and that’s how I felt." “I wouldn’t call it a disappointment,” Thome said. “The business of the game happens. Look, Ryan Howard was emerging into a monster. Unfortunately (the National League) didn’t have a (designated hitter). It would have been great to have him and I in the middle of the lineup. I get it. Trust me, at that point in my career, I didn’t look at it as being bitter and look at it as coulda, woulda, shoulda – things happen. Many other Phillies Wall of Famers – including Hall of Famers Mike Schmidt, Steve Carlton, and Jim Bunning – were on hand for Thome's night in South Philly. And several others (including Howard, who was obviously at the game, and Chase Utley, who wasn't, but will be in town on Tuesday with the Dodgers) left video messages that were played on Phanavision. In video message, Jimmy Rollins thanks Thome for helping him get a job with White Sox this year, said Thome "had a lot to do with that." The applause for Charlie Manuel is bigger. The people do love Charlie. And why wouldn't they? Thome said he felt like he was a part of the 08 World Series celebration because of how happy he was for his "father figure" Charlie Manuel. But, seriously, of all of the game's greatest players of the last 25 years, who else can you say that about? Griffey maybe.